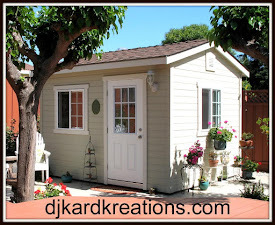 djkardkreations: Thank you for being a friend. Here's the thank you card I made you for yesterday's post. The base card is white. I die cut two flag banners using my MFT Die-namics Fishtail Flags die. One banner was cut using a snippet of ancient black and white polka-dottie patterned paper and the other was cut from a snippet of clear and black polka-dottie acetate. I believe the acetate is from SU. The image is by Stamping Bella "Bench Buddies." After stamping I used a stitched circle die from Li'l Inkers to cut out the focus pocus. I also cut one in black and offset it behind the white to create a shadow. The sediment is masked from an ancient Diamonds "Girl Friends" image and stamped in SU Bermuda Bay. The bling is from Queen & Co.
Not only was the theme inspired by my appreciation for your participation in regulation NBUS deeply felt upon the cessation and followed by the inhalation of libation ~ SLAP! Sorry. Hammy was running on his wheel. 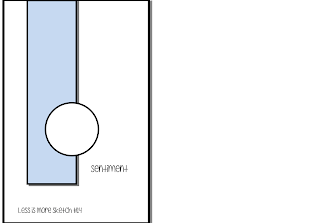 The sketch at Less Is More (below). 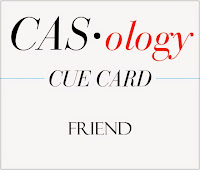 The cue card word at CASology which is "Friend." 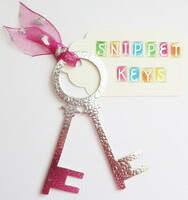 The theme at Pixie's Snippets Playground which is to use your "Snippets." The theme at Craft Stamper Take It Make It Challenge which is "Take a Stamp." Please click on the challenge links for the details on rules, sponsors, and prizes! It's lovely to introduce more new friends to you today! I hope you'll visit them, introduce yourself, and continue the circle of friendship across Blogland! Richard Breaks of That's MISTER Cardmaker, to you! Richard started blogging in 2011. It's always a joy to see what Richard has created. His works of art are no doubt familiar to you as Richard enters challenges, wins recognition, and serves on design teams throughout Blogland. He recently posted a couple of 2015 calendars that literally will make you gasp! Pooja of Reusing Cards & Quilling. Pooja has been blogging since 2012. She lives in India and is a software engineer. As you can tell from the title, in her spare time Pooja makes cards and quills. The best way to get to know her is to click on the "About Me" tab where she does a great introduction of herself and her love of reusing/recycling, which is very inspirational. And you won't believe the 3D projects and fold cards she makes, often with very detailed photos and instructions! Donna of Design by Donna. Donna has been blogging since 2010. Her profile simply says, "Loving retirement, it gives me more time to craft." Amen, sister! Donna is a familiar figure in many of the challenges that I frequent, especially sketch challenges. I always love her interpretations and the way she inspires me to stay alert to my surroundings for design ideas! Christine Hyde of CndnStamper on Splitcoast Stampers. Cindy has had a gallery at Splitcoast since 2008 and she has 1267 posts for you to click through and be utterly inspired by! You might want to put a visit to Christine on the top of your "To Do" list for the next rainy day! Melissa Lane of honeybeelane. Melissa has one of those blogs that you open and your jaw hits the keyboard. You just have to see it and her outstanding works of art! She is another brand-spanking-new blogger who started blogging just this month! You would never know it from her professionalism, her style, her incredibly beautiful cards, and those awards already flanking her side bar! Please do yourself a favor and go meet Melissa. Show her what a wonderful and supportive community we are! Thank you for joining, ladies and gentleman, and welcome to the Playhouse! I'm sure you won't be surprised to learn that because of my NBUS challenge, I have gotten dreadfully far behind in my normal visiting and commenting on your blogs. I feel badly about that because returning a visit or commenting is not a chore or a job for me. Some of you kindly tell me I don't need to return a comment, but that's just not how I roll. 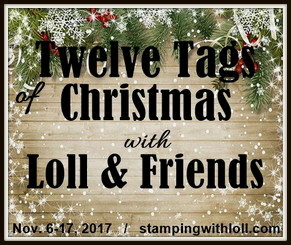 I think of making cards and writing my posts as two legs of my blog journey stool and visiting/commenting is the third leg. For me, that makes it equally important and necessary. And joyful! However, at this moment, in order for me to keep from burning out, which I'm sure you don't want, I realize that I need to simply file my inbox of hundreds of comments awaiting replies. Sometimes you just have to start over from scratch, right? Today, I'm starting over from scratch. If you left me a comment and I have not responded, please comment here. If you asked me a question and I did not answer, please ask me again. Otherwise, I'm going to assume you understand and I appreciate that! Remember, if you ever feel like I haven't visited you in quite a while, all you need to do is leave me a comment and I'll return the flavor. What a sweet card Darnell!!!! Thanks for joining CASology, and the NBUS was great FUN!!!!! You are a GEM!!! Another fab card missus and always loving reading your posts! Another gorgeous card Darnell. I do like black and white. A fabulous card - I love the black and white with just a splash of colour for the sentiment. Love this Darnell! The bold simple design is fab I'm a big fan of these uptown girl stamps!! Loving the stamp and sentiment. Such a gorgeous card Darnell. I love the image and stylish design. I am pleased your last NBUS challenge was so successful. Please don't feel that you have to return any comments to me. I visit your blog when I have time because I love reading your posts and seeing your fabulous creations. That image is adorable, Darnell! I love the tiny pops of Bermuda Bay (my favourite colour ever of course!) and those Queen & Co striped gems are so much fun! Thanks for playing along with CASology this week! Darnell, how sweet of you to give me that lovely introduction to all your friends! Two ladies have already stopped by and said hello, and I was so tickled to get their nice comments. Love your card. The black and white really works. Cute, cute image. I love black and white cards but don't seem to use it much. Will have to work on that. I love the sweet simplicity of your card. The image is darling. Your colors are awesome. It's easy to understand your "starting over." Just keep posting! Hey Darnell!! Thanks so much for introducing me on you blog. I'm humbled be your super kind words. What a nice surprise. I really like you sweet black and white card. The image of the 2 ladies is lovely. Friends are an awesome gift, right? I Love black and white cards and am a sucker for polka dots. How did you know?? 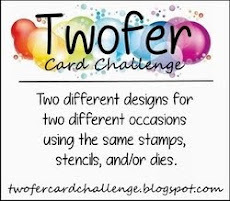 I love this friend image and the black and white card. You deserve a break and to take some time off. I imagine your eyes are so tired! Plus, I'm sure hammy needs to rest as well. I still don't know how you do all that you do. I would certainly understand if you needed some time to catch up. Don't want you to get carpal tunnel. smile. Hope you have a good week. PS. Can I send you some of our snow? Wonderful friend card. Such a sweet image, and I like the black and white. Have fun recovering from your NBUS challenge. I'd say it was a roaring success, and you are probably the most visited gal in blogland this month. Thanks so much for playing along at CASology this week. Love the way the two banners play together! Great combination of these challenges! Thanks for joining us at CASology this week! Love your card - especially the sentiment in a brightly colored ink - the perfect touch! Dear Darnell your friend card is sweet and nice. :-) I like the image. I love this all in black and white with just the pop of color in the sentiment. Really love that image you used too. I love your card! So cute in black and white (mostly). That pop of color is fun. Sometimes we don;t have to color up everything to have a stunning card! Thanks for the smile today! Such a cute card! <3 You are so sweet - that's totally understandable. I had to figure out a way to organize all the awesome blogs I was subscribed to [thank God for bloglovin and blogger feeds!] but I love being able to catch up when I have the time. :) You have nothing to worry about because my posts from today will be e-mailed to you tomorrow sooooo you can totally check those out if you have the time! :D Hope you have a fabulous day!!! LOVE your black and white with a tiny pop of blue! So perfect! I wouldn't worry about your comments at the moment Darnell, everyone knows you've been flat out with the NBUS challenge (and what a HUGE hit that was again!!). I'm sure everyone will understand. Love your card by the way, that stamp is so sweet! Oh, I love your darling card, Darnell!!!! Love the colour of the sentiment and the little bit of colour in her hair!!! Such a sweet image and a lovely sentiment to go with it!!!! Please make sure that you don't burn out, Darnell!!! I'm sure everybody understands that you have been very busy running the NBUS challenge and surely nobody would blame you for not visiting for a while!!! Good idea to start from scratch!!! Love the simple design in black and white! Hats off to you for using the dreaded acetate! I love this black and white friend card. Your NBUS challenge was fun too. Congrats on the number of linky's you had. What an awesome turn out!! Don't you worry about visiting or not visiting. We are not all strapped to the puter 24/7!! Wow Darnell this is a fabulous card. I love the simplicity of the design, the dotty flags and the gorgeous stamp. The offset circles make a great effect too. Absolutely love your take on the LIM sketch Dippy. The black and white is stunning with the pop of colour from the sentiment. Fab use of the dropped shadow on the circle. Of course we understand.......we all know you're Superwoman but to expect you to comment on 600 odd Linky posts, plus all the comments on your everyday posts would try the patience of a saint.....and I'm sure Mister would have something to say about that!!! Super sweet card, Darnell! Love that image and the fishtail banners :). You must have smoke coming off your keyboard after all of that NBUS commenting! Thank YOU for your friendship!!! You are a jewel and I am totally willing to give you a start over!! I am just so impressed with all the truly positive and pleasant vibes you put out there in blogland - YOU are a hero to me - in many ways!! Love your very clever and cute card - I especially love the second circle of black to add a shadow- never would have thought of doing that!! You have a most beautiful day and take a deep breath and realize we all LOVE YOU!!! Thanks for sharing... can't wait to play along in your next NBUS challenge. I had so much fun during the last one! When will the next one be? Darnell, you are sweeter than pie! :o) You are a treasure to us all and we know how hard you worked for NBUS! I'm glad you made the choice to start from scratch because otherwise you would be perpetually behind! We all know you love us, regardless of a missed comment or two. :o) Always remember that! As for your card, it is fabulous! I love the acetate, especially with sweet polka dots! The image is filled with warm fuzzies and I love the splash of color with the sentiment! Beautifully designed as always, my friend! Have a blessed and sparkly night! Love that black and white card! That acetate is a great touch. Take a well deserved break, you are loved and appreciated! Darnell, your card is adorable! Loving the black and white...so crisp and clean feeling. Glad Richard found his way here. He's a delightful blogging friend, and you will enjoy him! I think we've all had to start over. This should be fun, not stressful, so we all understand! You are amazing, my friend...hugs! Do I ever understand! You just delete it all & start over. I can't imagine how you keep up with it all anyway, and still enter all these challenges. I am admiring the way you did this super looking card. Interested to read that the black was acetate. Never saw any black acetate..now I'll be on the hunt. You had just THE right button to make these dotty fishtails look perfect, and I like the shadow circle. Hmmm...you know I'll borrow that idea (if I can remember it long enuff!). Best to Hammy, and I hope the libation was something I would like! Rest up. No burnout wanted. Soon as I catch up, I'll try to visit some of your new friends. I'll prolly like 'em too! TFS & Hugs. Darnell this card is darling, I love the black and white and that image is so sweet! 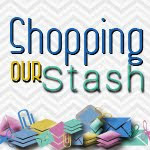 Lots of challenges nailed here, for me Shppping my Stash is pretty much a NBUS challenge--LOL Oh I need to stop "stacking my stash"! You are welcome and have a wonderful wee. Thank you for sharing with us at CASology! Very sweet black and white card! Love the acetate banners - never saw polka dotted acetate! Rest up and recover! You have been very busy! Well, isn't this just the sweetest thing! I love the black and white colors and the best of friends image. I bet the gal with the straight hair envies the gal with the cork screw curls and vice versa! (I don't know anyone that likes the hair they got stuck with)! And as for your design I can only say that you must be a teeny bit psychic. If you come and visit us at Freshly Made Sketches on Wednesday you'll see what I mean! What a lovely card. And thank you. Besides NBUS stuff shopping my stash is my next fav :) My stuff seems to multiply exponentially! My Ms 19 has decided to take up scrapbooking so fingers crossed she likes some of my stash and between us and Ms 9 we can make room for some more NBUS. So happy to hear that you've realized that commenting on a kazillion cards would take a year of Sundays! Amazing card! Clear & black polka dot acetate...somebody out in the crafting business seriously needs to pick this ball up and run with it cuz it is awesome! Fabulous image! Love the pop of Bermuda Bay and the striped brad! There are many things I like about your card. First that acetate vith dots, what a great detail. The little pop of color from the sentiment and the tiny colored detail on the image. The shade of black circle. I think it's a really cute card for a friend. Aww . . .what a lovely card you've made here Darnell. Fabulous card Darnell! I have a lovely card with that same image on, made for me by Mrs A :) Great idea to leave it uncoloured - I think I need to do that more often here! There is nothing like a well done B&W card. Look at all of the new friends! I have seen Richards work on Stamp TV... brilliant. I do so love the dotted acetate you used. What a great card and that little bit of green is such the perfect "pop" of color! Love the black and white, and your fab design as always. The tireless inspiration is truly the causation of my endless fascination with your beautiful creations. And of course we all understand, you crazy goon! You commented on every one of those 597 entries! Love B & W cards and this one is just darling. Adore the girl with the curly hair as she has hair just like mine LOL! Beautiful card, I've always liked the clean look of black and white! Darnell you have the most adorable items in your stash and this stamp is gorgeous. Perfect sentiment and I was going to suggest you head over to Uniko again but realised you'd have entered too many challenges for LIM if you did. Fabulous card Miss Darnell...love all the black and white with a touch of teal, so fun. And your sentiment, just so sweet. Oh, Darnell. We should be sending this card to you. You are such a good friend to all and I don't know how you keep up with commenting even without a recent nBUS challenge. I know I have difficulty and I don't follow as many blogs or challenges as you do. I love that you did this card in black and white. It's perfect for the challenge. Darnell, your card is the sahweetest! I just love the black and white with a touch of Bermuda Bay stuck in. I'm off to check out the challenges you linked up to :-) Have a great day! Love your sweet b/w card with the touch of colour - that image is fab! Thanks so much for playing along with Craft Stamper Take It Make It, and good luck! A wonderful card, Darnell and a fabulous sentiment. I love it! Sweet card, Darnell! Love the black & white! Love this black and white card!!!!! Darling image of the two friends reminds me of being a teenager in the 70's. Love that striped dot too! This is so striking in monochrome Darnell. I love that image and left as is, is perfect! Love that crisp b&w look Darnell! Love the black and white and that lovely image ... Great reading again Darnell! I know I am late but ts never late to say THANK you !! Thanks a lot for the mention :D.
What if I didn't ask a question before and want to ask one now? I mean, besides that one there? Well here's my question: WHY?! Feel free to delegate to Hammy. I like the polka dots and recognize right off that the one looked like it was on clear and it was. Too fun! As much as I love it when you drop by my blog - if I had a choice between you writing your fabulous posts that totally brighten my day, and seeing a comment - I'd want you to write your posts. Sadly, I've become very sporadic in commenting - but I am still reading and it always brightens my day! Thank YOU for being my friend, Darnell!